This is what grocery and hardware store shelving looked like when I was a kid back in the ’50’s (except for the Mickey Mouse telephone). How much room does anyone have to store groceries, dishes, pans, etc. in the kitchen? For us it always seems that everything is squished into lots of small cupboards. You have to be real careful when you reach for the barbecue tongs because the rolling pin might fall on your hand. Even worse, that bottle of vodka might just keel over and smash on the tile floor. We are fortunate that the door off the kitchen leads to the garage and in the garage we have a stand-alone closet that holds lots of stuff. Notice the corner with all the folding chairs? That is where I put the grocery store. 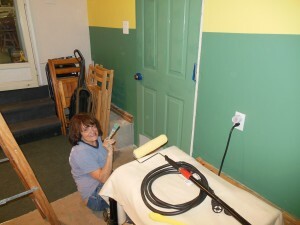 The chairs are now under the utility cabinets (not shown). I made space for them by tossing out empty boxes, among other things. That is where excess canned goods, paper supplies, and cleaning notions go. It is a bit crowded in there, though. My recent rebuild of the garage interior inspired me to make a special place for all those canned peas and rolls of waxed paper. I decided to use the little corner next to the small stairway that connects the garage and kitchen. Luckily I had just the right stuff to add a little flair to the project. Several months ago (closer to 12 than 3) my good friend Arthur (K1GTI) gave me a bunch of plywood and planks that were taking up room in his basement. They were once part of a small independent hardware store run by two brothers. The wood was at one time part of the aisle shelving from Armen’s Hardware and Art knew one of the owners, Sam Farmanian, who was also a ham radio operator (NM1Y, SK). We are not talking about a store from some ten years ago. This was the kind of store that I went to as a kid over 60 years ago. Shelves were made of wood. Each shelf was framed by a molding designed to accept price labels. 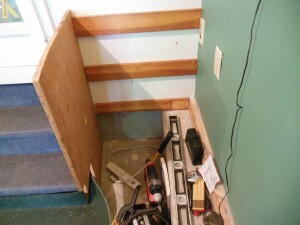 Counter tops were made of plywood that was encased in metal edging. This was the perfect medium for a vintage-looking grocery store. Of course all functional stores have a cash register. I just happened to have a 1920’s Remington register that needed a place to rest other than the floor of the garage. A strong shelf was in order. Unfortunately I had no plans. I anchored the shelving to studs in the wall. The plywood panel is being measured against the shelf supports so I can put matching ones on it for the opposite side. Notice the tools. This is only one third of the implements I eventually used. What a mess! I looked through an old Sunset DIY book and saw some simple shelves that inspired me. I drew up some rough plans and built mine around the foundation and sill plate of the garage. Every piece came from that ancient timber that I got from Arthur. Now we can store more groceries and it’s easier to access them. As an additional bonus the grandchildren have a new store to play with. Thanks, Art! 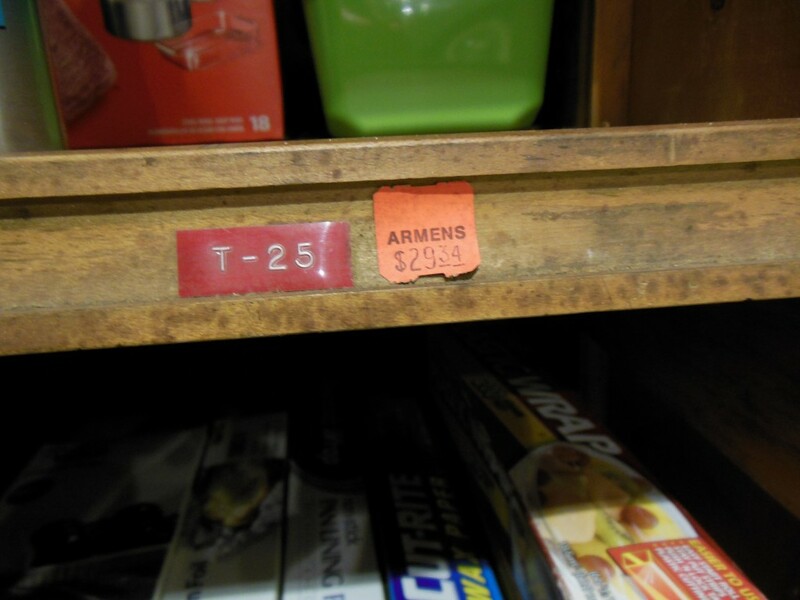 This old label informs us that the store name was Armens. The molding is designed to hold price cards. What was it that cost nearly thirty dollars? A staple gun? 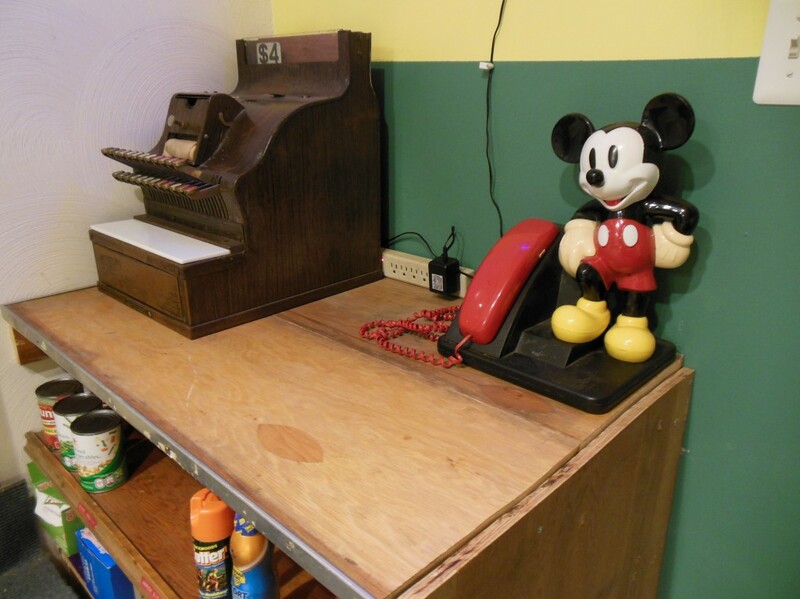 My grandsons will have fun talking on Mickey and ringing up sales on the old Remington register. I may add some molding to the panel on the right. 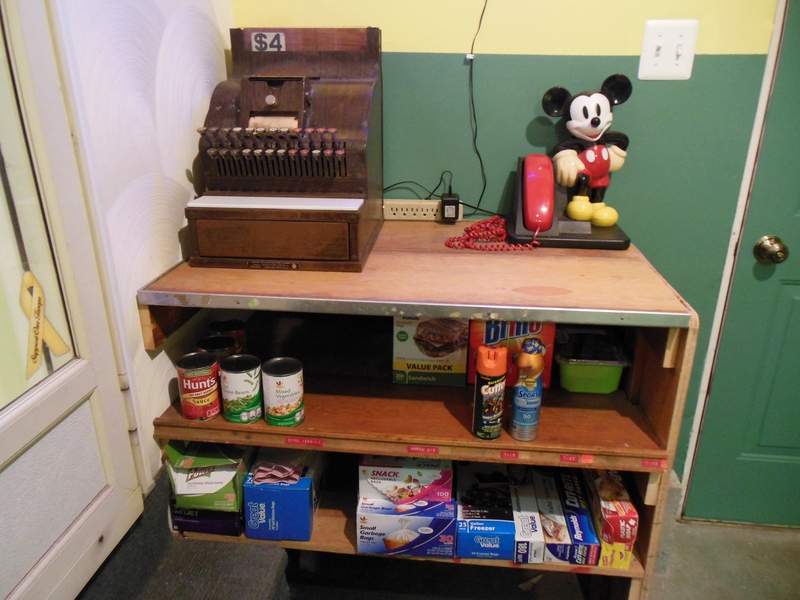 This entry was posted in Occasional Commentary, Radio: Amateur & Broadcast and tagged DIY, garage, grocery, ham, hardware, K1GTI, materials, mickey, mouse, radio, retro, shelf, shelving, store, telephone, vintage. Bookmark the permalink. Great job, Ken. I’m happy to see that shelving put to good use, instead of taking space in my basement. The Farmanian brothers must be smiling!